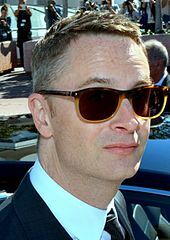 Director Nicolas Winding Refn promoting the film at the 2016 Cannes Film Festival. 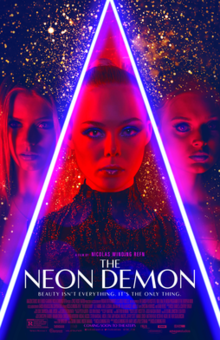 On November 3, 2014, Refn's production company Space Rocket Nation alongside its co-financiers Gaumont Film Company and Wild Bunch announced that Refn's next film would be titled The Neon Demon, to be filmed in Los Angeles in early 2015. Refn commented on the conception of the project: "I woke up one morning a couple of years ago and was like, ‘Well, I was never born beautiful, but my wife is,’ and I wondered what it had been like going through life with that reality,” he says. “I came up with the idea to do a horror film about beauty, not to criticize it or to attack it, but because beauty is a very complex subject. Everyone has an opinion about it." In January 2015, Dazed reported that the script for the film was inspired by Elizabeth Báthory. In discussing the script, which Refn co-wrote with Mary Laws, he stated: "I decided that I’d made enough films about violent men, and I wanted to do a film with only women in the film, and so I did this story because my wife would only go to L.A. if we had to travel out of Copenhagen. She’s like, ‘I’m done with Asia. 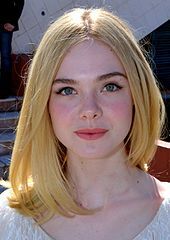 I will only do Los Angeles.’ And so I came up with an idea and went to L.A., and I cast this woman called Elle Fanning who is absolutely fantastic, and she played the lead." In subsequent interviews, Refn stated that he visualized the film as an "adult fairy tale." Star Elle Fanning at the Cannes Film Festival. On January 6, 2015, Elle Fanning joined the film to play an aspiring model, caught in a world of beauty and demise. Fanning came to Refn's attention because of his wife, who had been impressed by her performance in an earlier film. On January 29, Abbey Lee was added to the cast to play the role of Sarah. On February 5, more cast was added to the film, including Keanu Reeves, Christina Hendricks, Jena Malone and Bella Heathcote. On March 17, 2015, Karl Glusman was set to star in the film. Desmond Harrington was added to the cast on March 30, 2015. Principal photography on the film began in Los Angeles on March 30, 2015. Locations included downtown Los Angeles, while the motel sequences were shot on location at a real motel in Pasadena. Composer Cliff Martinez, who collaborated with director Refn on Drive, stated the films have similar styles, musically speaking, noting that for The Neon Demon he sought a "sparse electronic score." He stated in an interview that the first half of the film resembles "a melodrama like Valley of the Dolls, and the second half is like The Texas Chain Saw Massacre." According to Refn and Martinez the soundtrack was influenced by Giorgio Moroder, Goblin, Kraftwerk, Vangelis and Tangerine Dream. The soundtrack for the film was released on June 24, 2016, physically and through digital download, before being released on vinyl on July 8, 2016, by Milan Records. Sia composed an original song for the film titled "Waving Goodbye". On May 24, 2016 at the Cannes Soundtrack 2016 awards, Cliff Martinez was recognized best composer of the Cannes film festival for his soundtrack to The Neon Demon. In November 2015, Amazon Studios acquired distribution rights to the film in the United States, in partnership with Broad Green Pictures. The Jokers distributed the film in France. Scanbox Entertainment distributed the film in Denmark. The film had its world premiere at the 2016 Cannes Film Festival on May 20, 2016, before it was released in France on June 8, 2016. The film was then released in Denmark on June 9, followed by the United States on June 24, 2016. The film was released on DVD and Blu-ray on September 27, 2016. The Neon Demon received a mixed response from critics. Much like Refn's previous film, Only God Forgives, the film received both boos and a standing ovation during its premiere at Cannes Film Festival. It holds a 58% approval rating on review aggregator website Rotten Tomatoes, based on 226 reviews, with an average rating of 5.9/10. The site's consensus reads, "The Neon Demon is seductively stylish, but Nicolas Winding Refn's assured eye can't quite compensate for an underdeveloped plot and thinly written characters." On Metacritic, the film has a score of 51 out of 100, based on 45 critics, indicating "mixed or average reviews". Robbie Collin of The Daily Telegraph gave the film five out of five stars, stating, "When the film reaches its logical end point, Refn just keeps pushing, and eventually lands on a sequence so jaw-dropping – almost certainly a sly, glossy-magazine refashioning of Luis Buñuel and Salvador Dali's groundbreaking surrealist short Un Chien Andalou – that all you can do is howl or cheer." Tirdad Derakhshani, writing for The Philadelphia Inquirer, called Refn a "bold visionary artist... able to revel in the culture of instant gratification while also subjecting it to critique", giving the film three and a half out of four stars and calling it a "brutal masterpiece". Rene Rodriguez of The Miami Herald wrote positively of the film's visuals and experimental filmmaking, writing, "To complain that The Neon Demon lacks substance or that it doesn't have anything to say about our cultural obsession with beauty is to miss the crazy, cracked pageant unfolding in front of you. Not all movies are intended to be read like books; some are meant to be experienced," going on to call it a "film that is guaranteed to elicit strong reactions." He awarded the film three out of four stars. Owen Gleiberman of Variety gave the film a mixed review: "A horror film is what The Neon Demon is (sort of). It’s set in the Los Angeles fashion world, and it’s the kind of movie in which models look like mannequins that look like slasher-film corpses, and corpses look like love objects. Beauty mingles with mangled flesh, and each fastidiously slick image seems to have come out of Twin Peaks: Fire Walk with Me or The Shining or a very sick version of a Calvin Klein commercial. Every scene, every shot, every line of dialogue, every pause is so hypnotically composed, so luxuriously overdeliberate, that the audience can't help but assume that Refn knows exactly what he's doing – that he's setting us up for the kill. He is, but not if you're on the lookout for a movie that makes sense. (Oh, that.)" Todd McCarthy of The Hollywood Reporter gave the film a negative review and called it "[a] stultifyingly vapid, ponderously paced allegorical critique of the modeling world whose seethingly jealous inhabitants can't wait to literally chew each other up and spit each other out". Glenn Kenny of The New York Times criticized the film as "ridiculous and puerile," and opined, "Mr. Refn composes striking images, but they're all secondhand: faux Fellini, faux David Lynch and so on." The Telegraph's Tim Robey deemed The Neon Demon the "most offensive film of the year," specifically citing its necrophilia sequence as exploitative, though he conceded it is not "any fault of Malone’s, who commits herself utterly to making it an anguished, desperate, if inevitably revolting minute or so of screen time. It’s a question of context, and how this scene – which stands alone, advancing nothing in the overall arc of the story, and is one of very few not to feature Fanning – slots into the film’s overall thesis." The French film magazine Cahiers du cinéma named The Neon Demon the third-best film of 2016. ^ "The Neon Demon (18)". British Board of Film Classification. June 6, 2016. Retrieved June 6, 2016. ^ Leigh, Danny (May 12, 2016). "'Movie blood tastes so good' – on The Neon Demon set with Nicolas Winding Refn". The Guardian. Retrieved May 16, 2016. ^ "The Neon Demon". Box Office Mojo. Retrieved December 6, 2016. ^ Tallerico, Brian. "A Horror Film About Beauty: Nicolas Winding Refn & Elle Fanning on "The Neon Demon" - Interviews - Roger Ebert". ^ a b "2016 Cannes Film Festival Announces Lineup". IndieWire. Retrieved April 14, 2016. ^ a b "Cannes 2016: Film Festival Unveils Official Selection Lineup". Variety. Retrieved April 14, 2016. ^ "Nordisk Film & TV Fond :: Nicolas Winding Refn Readies Danish/French Horror Tale". Retrieved January 20, 2015. ^ a b Feldberg, Isaac (June 20, 2016). "Director Nicolas Winding Refn sees 'Neon Demon' as an adult fairy tale". The Boston Globe. Archived from the original on March 31, 2019. ^ Taylor, Trey (January 2015). "Five things we know about Nicolas Winding Refn's new film". Dazed. Retrieved April 12, 2016. ^ Shaw-Williams, H. (September 7, 2015). "Nicolas Winding Refn on The Neon Demon's Female-Dominated Cast". Screen Rant. Retrieved December 17, 2015. ^ Sneider, Jeff (January 6, 2015). "Elle Fanning to Star in Nicolas Winding Refn's Horror Movie 'Neon Demon' (Exclusive)". thewrap.com. Retrieved February 6, 2015. ^ Refn & Fanning 2016, 18:30. ^ Fleming Jr, Mike (January 29, 2015). "Nicolas Winding Refn Sets Abbey Lee To Star In 'Neon Demon'". Deadline Hollywood. Retrieved February 6, 2015. ^ Keslassy, Elsa (February 5, 2015). "Keanu Reeves, Christina Hendricks Join Cast of Nicolas Refn's 'The Neon Demon'". variety.com. Retrieved February 6, 2015. ^ Kroll, Justin (March 17, 2015). "Karl Glusman Signs With WME; Joins Nic Refn's 'The Neon Demon'". Variety. Retrieved March 31, 2015. ^ McNary, Dave (March 30, 2015). "Desmond Harrington Joins Elle Fanning in 'Neon Demon'". variety.com. Retrieved March 31, 2015. ^ "On the Set for 3/30/15: Brad Pitt, Christian Bale & Ryan Gosling Start on 'The Big Short', Julianne Moore Wraps 'Maggie's Plan' & More". ssninsider.com. March 30, 2015. Archived from the original on April 23, 2016. Retrieved March 31, 2015. ^ Lesnick, Silas (March 30, 2015). "Production Begins on Nicolas Winding Refn's The Neon Demon". comingsoon.net. Retrieved March 31, 2015. ^ Refn & Fanning 2016, 16:39. ^ a b Miska, Brad (March 15, 2016). "'The Neon Demon' Is 'Valley of the Dolls' Meets 'The Texas Chainsaw Massacre'?!". Bloody-Disgusting. Retrieved April 16, 2016. ^ "Nicolas Winding Refn, Vinyl Curator". The New York Times. May 20, 2015. ^ Martinez, Cliff (June 23, 2016). "Nicolas Winding Refn And Cliff Martinez Talk THE NEON DEMON". ^ "'Drive' Composer Cliff Martinez on Writing the Most Fire Film Score of 2016". ^ Jaugernauth, Kevin (April 12, 2016). "Full Soundtrack Details Revealed For Nicolas Winding Refn's 'The Neon Demon,' Summer Release Scheduled". Indiewire.com. Retrieved April 18, 2016. ^ Evangelista, Chris (April 12, 2016). "Soundtrack Details and Release Date Info for Nicholas Winding Refn's The Neon Demon Revealed". Cut Print Film. Retrieved April 18, 2016. ^ "Cliff Martinez – Best composer of Cannes Soundtrack 2016 | Cannessoundtrack". cannessoundtrack.com. Archived from the original on June 24, 2016. Retrieved May 25, 2016. ^ a b Evry, Max (November 9, 2015). "Amazon Acquires The Neon Demon, Plus New Elle Fanning Image". comingsoon.net. Retrieved November 10, 2015. ^ Hipes, Patrick (May 10, 2016). "Amazon's 'The Neon Demon' U.S. Release Date Set As Broad Green Comes Aboard". Retrieved May 10, 2016. ^ a b "The Neon Demon". Scanbox Entertainment. Retrieved May 4, 2016. ^ "Screenings Guide – 2016 Cannes Film Festival" (PDF). May 16, 2016. ^ Hayes, Britt (April 10, 2016). "'The Neon Demon' Reveals New Image and Fantastic Posters From Nicolas Winding Refn's Latest". ScreenCrush.com. Retrieved May 4, 2016. ^ Staff, Variety (April 14, 2016). "'Neon Demon' Trailer: First Look at Nicolas Winding Refn's Horror Film". Variety. Retrieved April 18, 2016. ^ Lowman, Rob (April 28, 2016). "See all the 2016 summer movies". OcRegister.com. Retrieved April 29, 2016. ^ D'Alessandro, Anthony (June 25, 2016). "'Dory' Swallows 'Resurgence'; 'Shallows' Rides $16M Wave; 'Free State of Jones' & 'Neon Demon' Wounded". Deadline Hollywood. Penske Business Media, LLC. Retrieved June 26, 2016. ^ Nordine, Michael. "'The Neon Demon' First Reactions: Walkouts, Yelling at the Screen and a Five-Star Review in Cannes". Indiewire. Retrieved May 21, 2016. ^ Barkan, Jonathan (May 19, 2016). "'The Neon Demon' Was Booed at Cannes". Bloody-Disgusting.com. Retrieved May 19, 2016. ^ "The Neon Demon (2016)". Rotten Tomatoes. Retrieved July 13, 2016. ^ "The Neon Demon reviews". Metacritic. Retrieved July 7, 2016. ^ "The Neon Demon's jaw-dropping depravity leaves Cannes reeling – review". Retrieved July 2, 2016. ^ "'Neon Demon': Elle Fanning mesmerizes in brutal masterpiece". Retrieved July 2, 2016. ^ "We need to talk about 'The Neon Demon' (R)". Miami.com. Retrieved July 2, 2016. ^ Gleiberman, Owen (May 19, 2016). "Cannes Film Review: 'The Neon Demon'". Retrieved May 21, 2016. ^ Kenny, Glenn (June 23, 2016). "Review: In 'The Neon Demon,' Beauty Masks a Rotting Core". The New York Times. Retrieved June 25, 2016. ^ Robey, Tim (July 7, 2016). "The Neon Demon is the most offensive film of the year - and not because of the necrophilia". The Telegraph. Archived from the original on March 31, 2019. ^ "Top Ten 2016, Décembre 2016 n°728". Cahiers du cinema. Refn, Nicolas Winding; Fanning, Elle (2016). The Neon Demon (Blu-ray audio commentary). Broadgreen Pictures.